Fiction | Mary Logue | Author. Poet. Rug Maker. Mary Logue has written other novels and short stories, check them out. 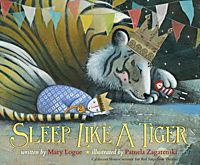 Sleep Like a Tiger, Winner of the Caldecott and Zolotow Awards. In this magical bedtime story, the lyrical narrative echoes a Runaway Bunny–like cadence: "Does everything in the world go to sleep?" In sincere and imaginative dialogue between a not-at-all sleepy child and understanding parents, the little girl decides "in a cocoon of sheets, a nest of blankets," she is ready to sleep, warm and strong, just like a tiger. Caldecott Honor artist Pamela Zagarenski's rich, luminous mixed-media paintings effervesce with odd, charming details.